Viruses Attacks In today's world, most people have Internet access and the Internet is full of viruses, worms, and other malicious software looking for a way into your system. 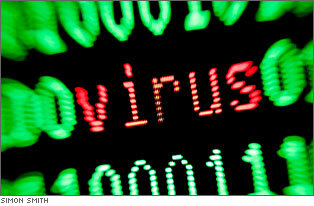 To protect your system from Viruses Attacks, do the following tips. Always Use a Firewall; Firewall is hardware or software that prevents hackers or malicious software from getting into your computer without your knowledge. For Windows XP, you can use Windows Firewall. Windows 2000, and Windows 9x/Me do not offer a firewall. For these OS you need to use third-party software. Within Windows XP, you can change firewall settings by clicking Start and right-clicking My Network Places. Then, select Properties from the shortcut menu. The Network Connections window opens, as shown in the image. Viruses PC attacks firewall setting up Select your network connection (in the image above, the Local Area Connection is selected), and click Change Windows Firewall settings. The Windows Firewall window opens, as shown in the image above. Make sure On (recommended) is selected and click OK to apply the change. Install and run antivirus (AV) software and keep it current. Configure the AV software so that it automatically downloads updates to the software and runs in the background. To be effective, AV software must be kept current and must be turned on. Set the AV software to automatically scan e-mail attachments. Microsoft is continually releasing new patches, fixes, and updates for Windows XP, and, to a limited degree, for Windows 2000. For these OSs, you need to keep your installation of Windows current with all the latest updates. Many of these updates are to fix bugs in th system and to plug up security leaks. Windows XP offers a way to automatically download and install updates. To verify that Windows XP is automatically maintaining updates when connected to the Internet, click Start, right click My Computer, and select Properties from the shortcut menu. The System Properties dialog box opens. Click Automatic Updates, as shown in the image below. For best results, select Automatic (recommended) and chose the day and time to download and install updates. Click OK to apply your changes. Windows 2000 does not offer automatic updates. For this OS, you need to periodically go to the Microsoft Web site Update.microsoft.com, and manually download and install updates. Currently, Microsoft only updates Windows 2000 to solve problems with security. There are no more updates for Windows 9x/Me.